To join the fun, just click here! 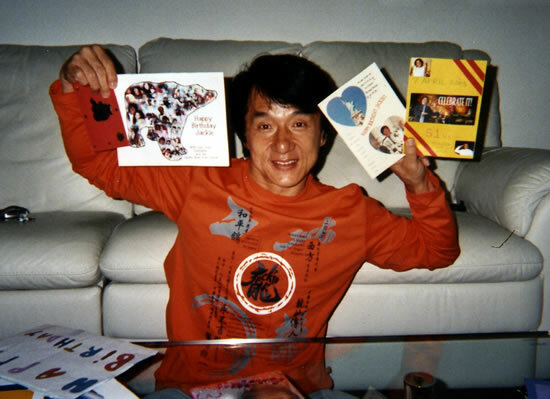 Jackie With Kids Corner Birthday Cards! 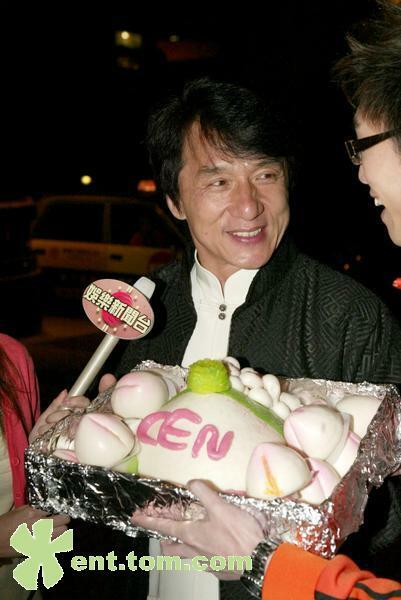 The hidden message (the "Easter Egg") was Jackie's birthday buried in the headline. Jackie was born in the 4th month on the 7th day in 1954! Congratulations to Matty! He wins an autographed photo of Jackie for his good work. 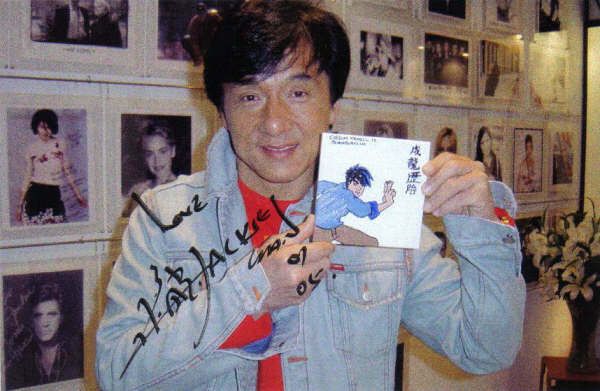 Twelve year-old Callum was thrilled to receive an autographed photo of Jackie holding his tile! Click here to read more about the ongoing tile project. 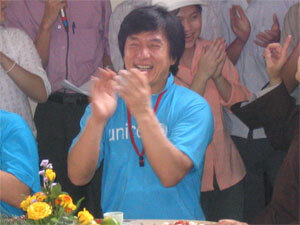 In an azure shirt and blue jeans, Jackie Chan looked younger and more energetic than his 51 years when he appeared on April 24 at Phap Van pagoda in the suburbs of Hanoi, where 100 mostly young people living with HIV/AIDS and their families come to receive spiritual counseling, information and food. Contrary to many people's imaginations, the kung fu superstar was surprisingly open and friendly, and took part actively in activities with monks and group members. 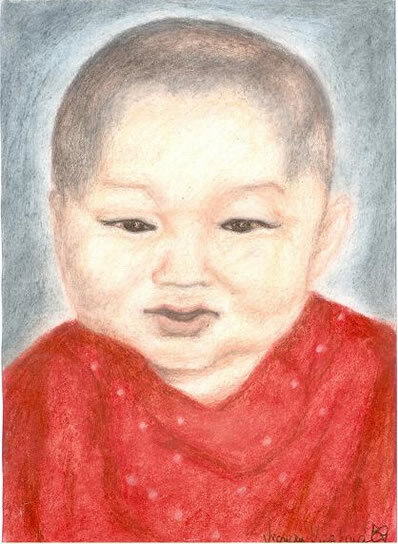 Jackie meditates with Ven. Thich Thanh Huan and members of the community center Lotus Club in Phap Van pagoda, Hanoi, last weekend. 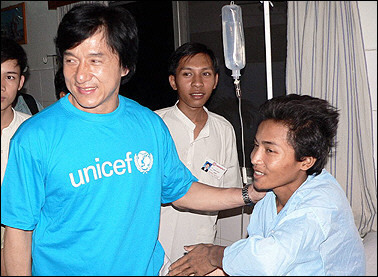 Although UNICEF Vietnam had said Chan would arrive at Phap Van pagoda at 10 a.m., reporters flocked there very early in the morning. Thirty minutes late because of a long journey back from Quang Ninh province, northeast of Hanoi, which has some of the highest HIV infection rates in the country, Chan joined Ven. 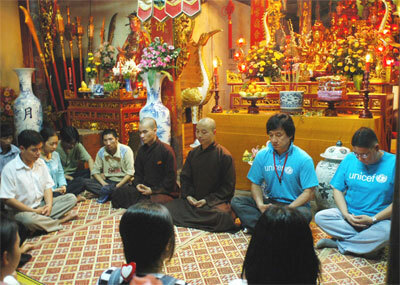 Thich Thanh Huan and members of the community center Lotus Club in meditation. 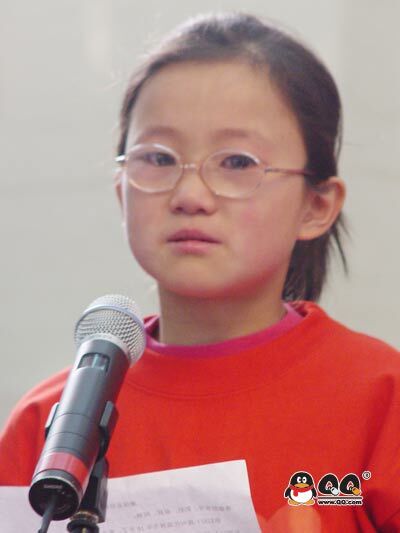 Afterward Chan and the group discussed HIV/AIDS and the discrimination people with it face. In his first words to the crowd, the charismatic actor said, "I may be a movie hero, but the real heroes are the people I've met in Vietnam, among them, grandparents, mothers and wives, and many young people and children, who are showing real courage in dealing with people living with HIV/AIDS and who must be supported much more." With much emotion, Chan told monks, nuns and group members about his difficult childhood and how his view toward charity works had changed. Jackie sings the refrain of the Vietnamese song "This World Is Ours." "Before I didn't like charity. I just wanted to be famous and to earn more money," said Chan. "My friends taught me and now I like to do charity. Even when I am sleeping, I think how I can help other people. Every human being has to learn how to do charity." He also joked: "(Being) a goodwill ambassador is more difficult than an actor. As an actor, if I do something wrong, I will do it again. Being an ambassador, I cannot do something wrong. Everything is new to me." He then played a game with patients and volunteers in the pagoda courtyard. Though a world-famous movie star, Chan appeared normal and sympathetic, hardly what was most likely imagined by those at Phap Van beforehand. "Real heroes are people who do extraordinary work," Chan said. 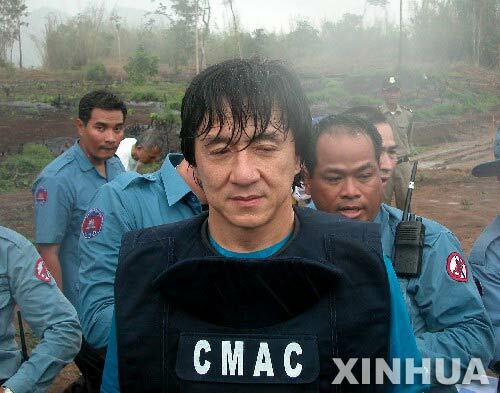 "Two days is not enough," the action-film star said of his April 22-25 mission to Vietnam. "It's not a one-day job. This work must continue. My mission is to stop discrimination. We have to say no to discrimination." According to statistics from UNICEF Vietnam, there are an estimated 215,000 people already infected with HIV/AIDS in the country. With a national prevalence rate of 0.4 percent, between 40 to 120 people, the majority under the age of 29, are infected every day. For more on Jackie's Goodwill works, click here. 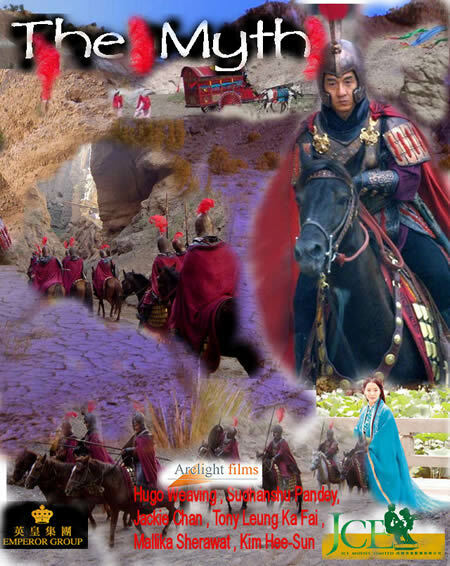 Well, there are a bunch of things that the webmaster rearranged and she added some things too. First, check out the Remake a Jackie Poster section to see Matty's new poster and one from Gokberk. Next, check out the Sharing Corner for a story that was posted last year in the Latest Jackie News and then was forgotten about. It's a great story about a special tae-kwon-do class. Then head on over to the Totally Fun Jackie Stuff pages where things have been rearranged to put the more popular features on the front page. Hope everyone has fun with the new additions and the movements! Jackie visited a Vietnamese communal health center and a support group session where people who have family members with HIV/AIDS can get counseling. While there, he played with the children, "listening" to their hearts through his toy stethescope. 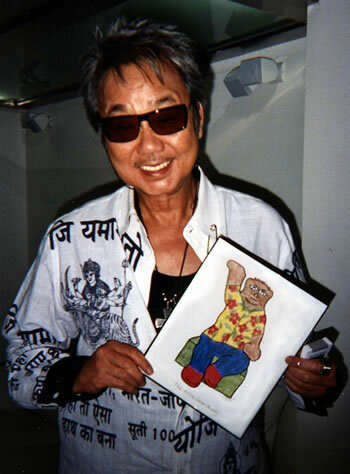 After Jackie left, children on bikes chased after him, calling out his name in Vietnamese and greeting him with "Chao Bac!" or "Hello Uncle!" Jackie repeatedly urged them, "Wear a helmet. You have to keep safe." 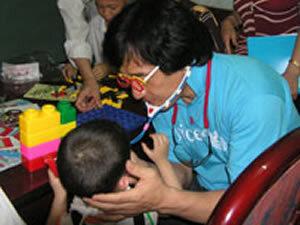 "Doctor" Jackie carefully examines a patient while wearing his special Doctor glasses. "Doctor" Jackie interacts with another little one. 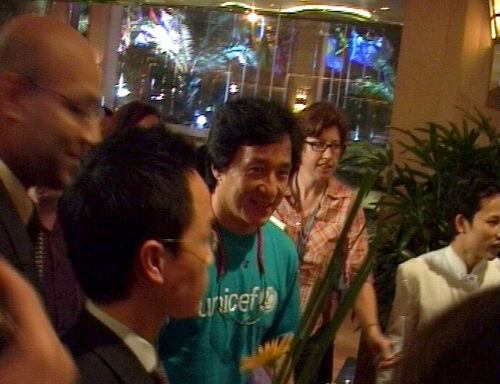 Jackie has arrived in Viet Nam as a representative from UNICEF. He will visit several places where he will try to spread the word about preventing HIV/AIDS infection. Jackie bestows a kiss on a young Cambodian landmine victim. 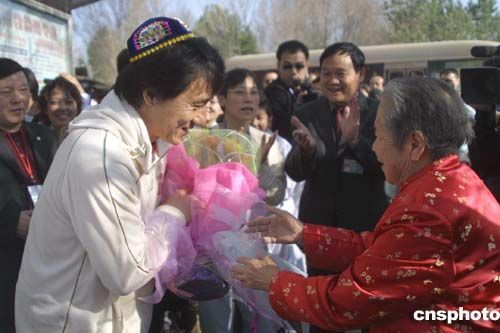 Jackie is greeted by local people. Right after exploding a landmine. As you have seen from the news in recent days, Jackie is on a mission. What is this mission? 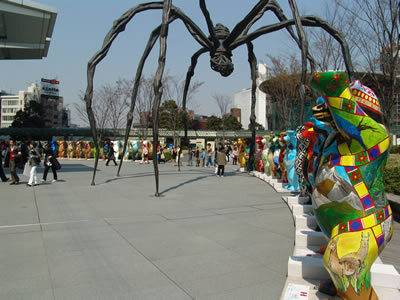 To bring the world's attention to the continued difficulties that people are suffering because of natural disasters such as the tsunami and man-made disasters such as landmines. When the tsunami hit several months ago, you could not look at a news report without seeing photos and videos of the terrible destruction and loss of life. Slowly over the last months, those photos and videos have moved into the background. It was Jackie's idea to remind people that these victims STILL need our help. He was very lucky to be joined by Miss World and Miss Indonesia. Their celebrity helped drum up attention where it belongs - on the victims. Jackie has said that the work that has been done so far to help these people is just the "tip of the iceberg." The victims are so fortunate to have people like Jackie and the other celebrities bringing the attention back where it belongs. If you look at the faces of the people who come to see Jackie and the women, you will see happiness, excitement, and joy. Amidst the sorrow and destruction, Jackie, Miss World, Miss Indonesia, and the others are a shining light. For a few moments, when they look at the smiling face of their beloved Jackie or the sparkling crowns of the beauty queens, they can think of something other than their own grief. This in itself is a gift to them. The hundreds of journalists and photographers following them around is a gift which will pay off in the long term. Photos, videos, and stories bring about awareness. And awareness causes ACTION. I have heard from several website visitors who have told me that just looking at the photos from Indonesia has prompted them to donate more money. Yes, they donated money when the disaster happened, but these stories and photos have made them realize that the money is still needed. And they have come through. Thank you Jackie. Thank you Miss World. Thanks to all the celebrities who spend their spare time helping other people rather than taking $20,000/day vacations and going on million dollar shopping sprees. The world needs more people like you. Jackie continues his goodwill tour of nations which are plagued by landmines. Landmines are bombs which are buried right beneath the surface of the ground. Thousands of people every year step on these bombs and are injured or killed. 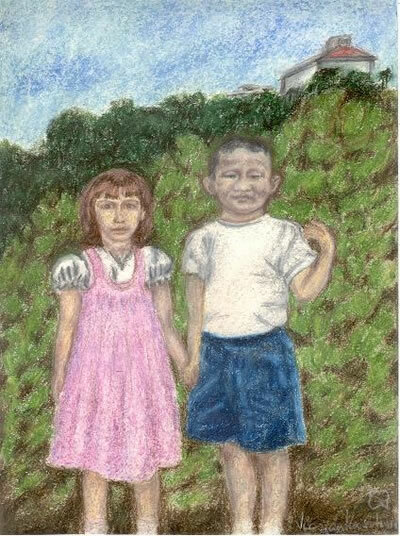 Many of the victims are children. Jackie visits landmine victims at the Battambang Emergency Hospital in Battambang. 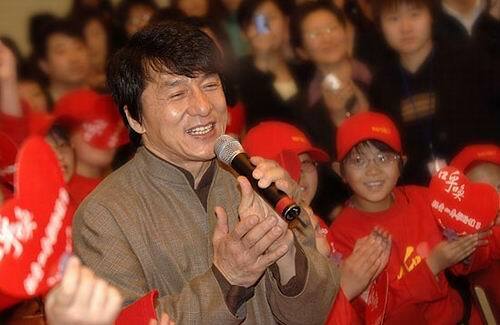 Jackie will visit Vietnam on April 23 - 25. To read more about Jackie's activities, click here. That Buddy Bear Willie is holding looks an awful lot like him, don't you think? Well, maybe not. But Willie seems to like it! 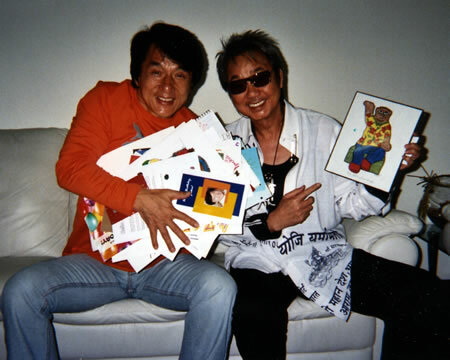 Below you can see a photo of Jackie holding ALL the birthday cards and Willie holding his special Buddy Bear! 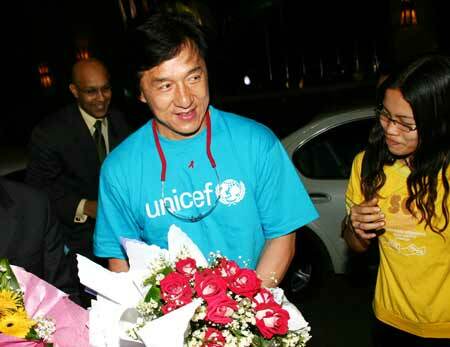 Jackie is on another goodwill mission, this time to Indonesia. 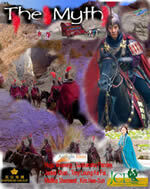 He is being joined by friend Eric Tsang, Miss World Maria Julia Mantilla Garcia (Peru), and other celebrities. 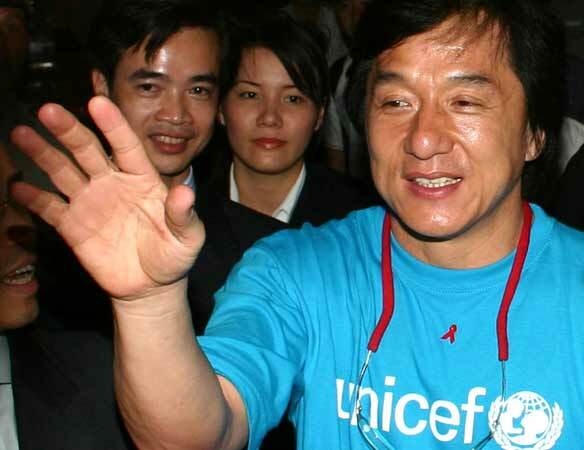 Jackie has visited a Children's Center which is run by UNICEF and has stopped by refugee camps to lend support. 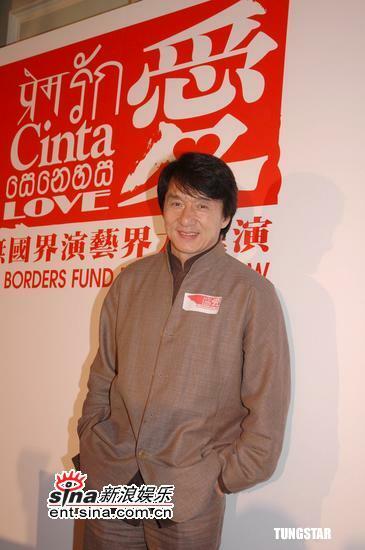 According to ChinaNews.com, Jackie is trying to raise awareness of the continuing needs of the tsunami victims. He is set to meet with Indonesian dignitaries as he continues his tour of the tsunami-torn area. 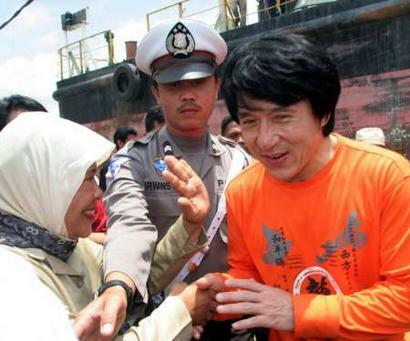 (AAP Photo) - Action film hero Jackie Chan greets villagers as he visits tsunami-ravaged Banda Aceh. 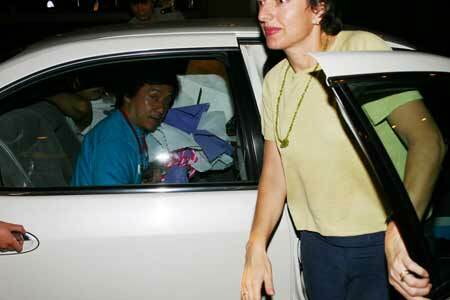 Jackie arrives at the airport in Jakarta to the delight of many fans. 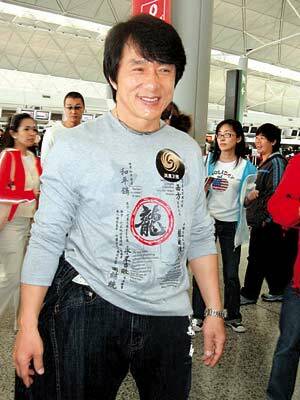 Jackie told ChinaNews.com that he packed only t-shirts and jeans for the trip. Miss World wasn't so lucky - she is expected to wear much finer clothes (and her crown!) for her visit. An Indonesian woman is thrilled to see Jackie! Jackie and Maria Garcia (Miss World) view the devastation. A young child plants a big kiss on Miss World. The visit by international celebrities provided a welcome break from the day to day grief that the Indonesians are dealing with. 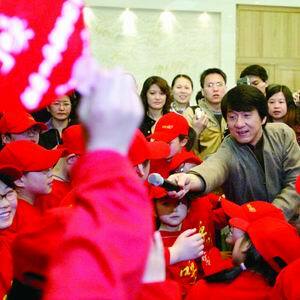 Jackie's visit sparked tremendous interest by the press worldwide. This is just what Jackie intended - to bring attention to the area. Although the tsunami hit many months ago, the people still need a lot of help. To them (and to us), Jackie is a hero. 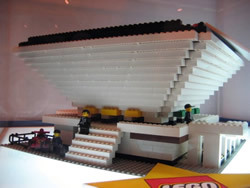 Did you ever think that Hong Kong's most impressive sights could be reproduced using Lego building blocks? Well, take a look below and see what can be done! Click on the photo to see a slide show of photos from the exhibit. The photos in this album were forwarded through email until they ended up in the Kids Corner mailbox. If the person who took them would like to be credited, please email the webmaster. Thanks to Fibe for sending these great photos! It may be hot out, but Jackie's hair remains perfect. Jackie attended the press conference for "Song of Eternal Sorrows" this past week. 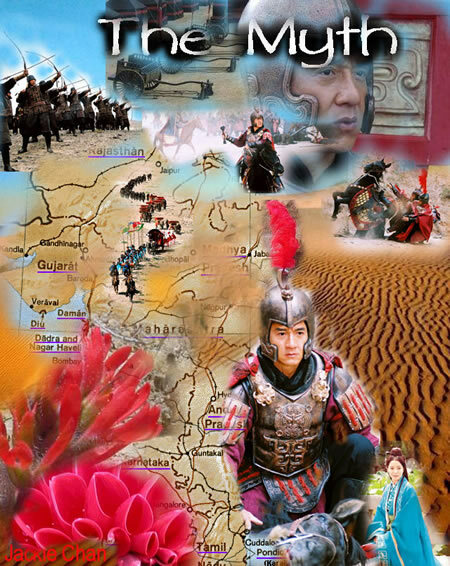 This movie, by Hong Kong director Stanley Kwan, is scheduled to be shown at Cannes this year. 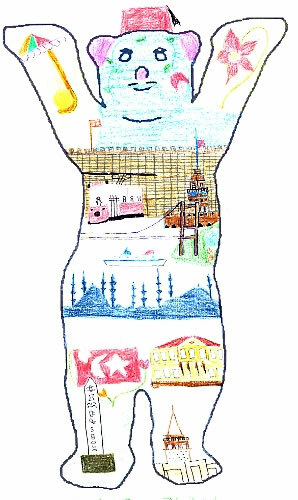 The Kids Corner resident cartoonist is back from her trip to China and is busy drawing new designs for your enjoyment. Check out her latest "Jackie With a Camera" (below). There will be a Coloring Page for this design very soon. Welcome back Holly! We missed you. Official Site Has Some Great Goodies! 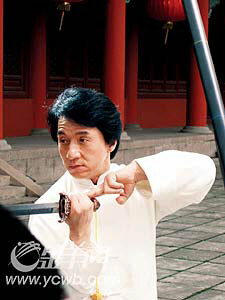 As many of you know, JackieChan.com is undergoing some reconstruction right now. However, you can have a little peek at some of the great things that are planned and even see Willie's "Scrapbook." Very exciting! Click here! According to an article in The Times of India, Jackie's "Myth" co-star has been invited by Jackie himself to accompany him to the Cannes Film Festival on May 11-22. The Myth is scheduled to be screened there. 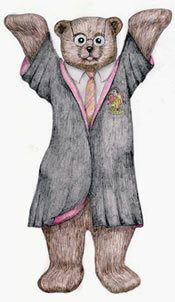 Thanks to Petra from Germany for sending in her beautiful Harry Potter Buddy. Click here to see all the Buddy Bears! 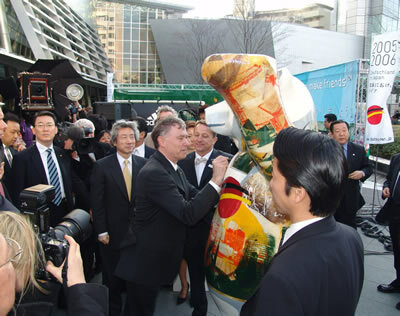 At the opening Mr. Köhler and Mr. Koizumi signed a very special bear- the Buddy Bear designed by the artist Frank Rödel representing "Germany in Japan." The Associated Press article about Jackie's new business ventures is making news all over the world. Newspapers in cities across the globe have picked up the article and published it in print and online formats. 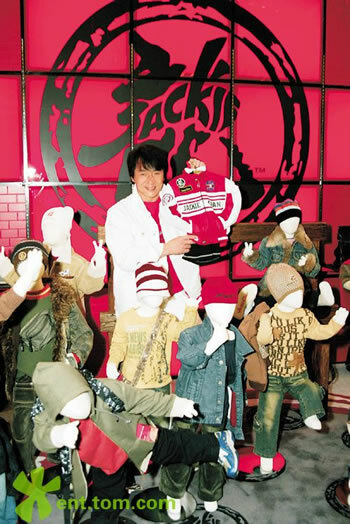 This is very exciting news for Jackie as he starts up new businesses. 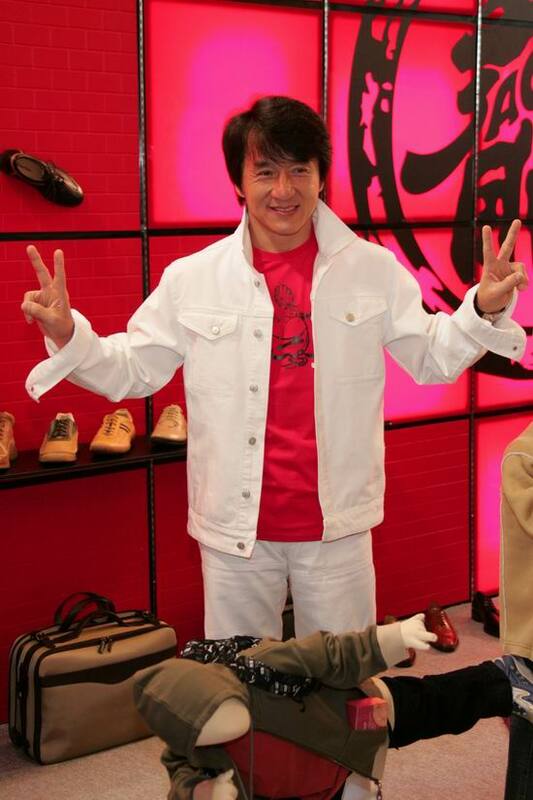 HONG KONG -- His fans own copies of "Rush Hour" and "Shanghai Noon," but now kung fu movie star Jackie Chan wants them to wear his T-shirts, sleep on a bed he designed and shop at his supermarket. One of the world's most famous Chinese celebrities hopes to parlay movie superstardom into a merchandising and retail empire that encompasses everything from clothing to cookies. 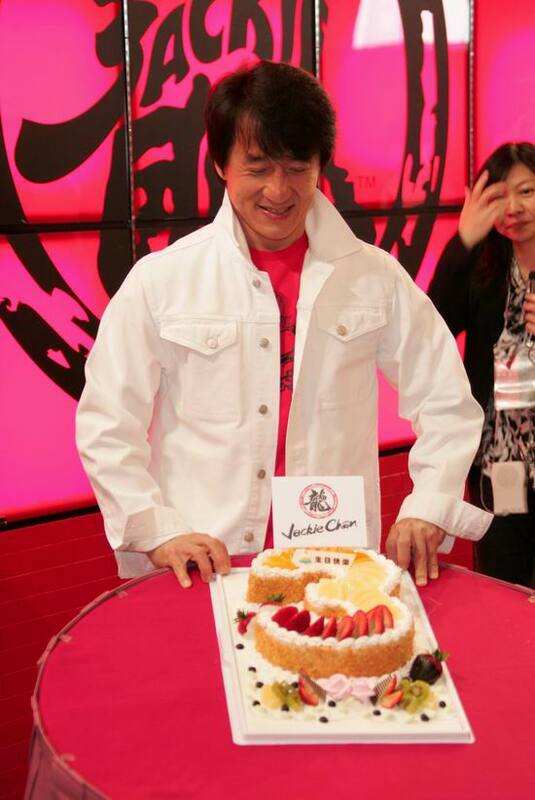 The action star's expanding business portfolio includes a clothing label, "Jackie's Kitchen" restaurants, a sushi eatery chain, "Jackie Chan signature club" gyms and most recently, a line of chocolates and nutritional oatcakes. Chan made his first foray into business 20 years ago, but failed because he wasn't savvy enough. "I thought since I could make movies, I tried business on my own. I didn't know how to calculate, how much things I bought cost, how much a month's rent cost ... I lost several million, then millions again," he told reporters at a celebration of the third anniversary of his clothing line. Now, Chan said he's hired professional businessmen to do the nitty-gritty work. That executive, Bon Bg, says the actor's goal is "total lifestyle branding" and hopes to expand into furniture and kitchen ware. But for now, Chan says he still earns more money making movies and that remains his top priority, adding he donates his business profits to charities because it's icing on the cake. "I feel guilty about that money ... But the money I make from jumping from the second floor, this hard-earned, blood-and-sweat money ... I'll save for myself," he said. Jaycee arrives at the party. 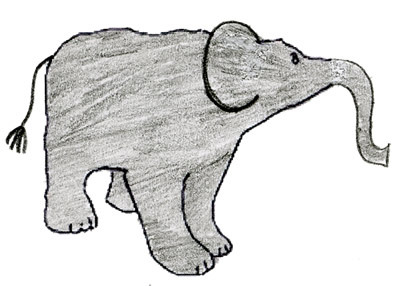 Kids Corner friend Kriszti has sent some wonderful drawings. Thank you Kriszti! 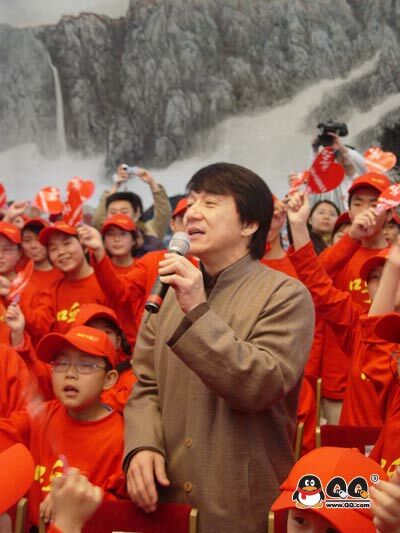 Kung fu superstar Jackie Chan says movie-making is still his biggest priority despite an expanding business empire that includes a clothing label, fitness clubs, restaurants, and a line of cookies. "For me the greatest source of income is still movies. Nothing - stocks, financial speculation, real estate speculation or businesses - makes more money for me than making movies," Chan told a news conference celebrating the third anniversary of his clothing line. Chan said he donates the earnings from his businesses to charities, but didn't give any details. "The money I make from jumping from the second floor, this hard-earned money ... I'll save for myself," he said. 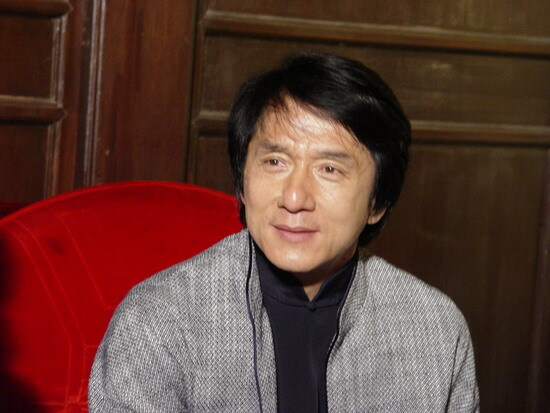 Outside of fashion, Chan also operates restaurants under his name and recently teamed up with the California Fitness gym chain for "Jackie Chan signature clubs". He recently announced that he was delving into the snack industry with a line of cookies and chocolates for the health conscious. Chan said previous business ventures had failed because he didn't have the know-how, but he's now working with professional businessmen. 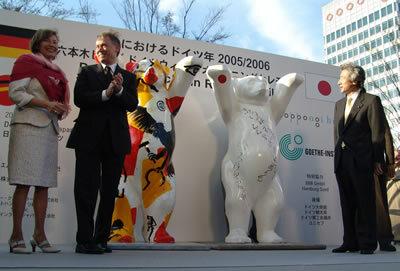 Chan also said the popularity of his businesses points to his own growing fame. 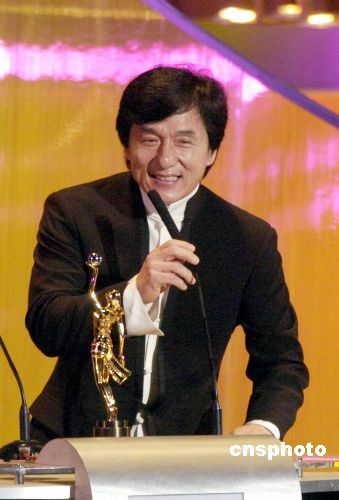 "This proves I succeeded in Hollywood," said Chan, the star of the Rush Hour movie series. 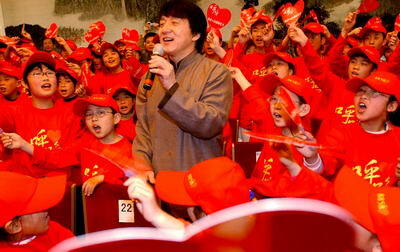 During his recent visit to Xinjiang, Jackie carried out many chartitable activities and auctions. 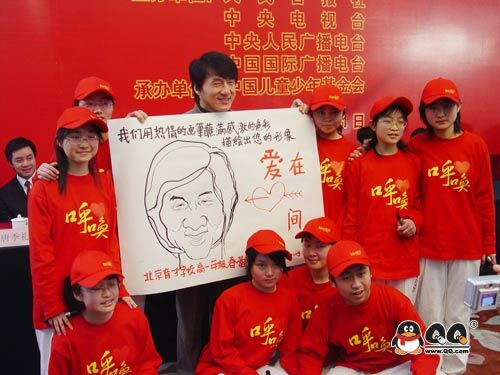 He raised 3.3 million Yuan (about US$360,000) to help the needy. While there, he visited orphans and widows and gave them gifts as well. He was treated to a birthday cake (a few days early, since he was there on April 1 through 3). He visited a home for the elderly and gave them clothing. He gave a lecture at the Xinjiang University and later arranged to have a doctor examine village children. On April 3rd in the evening, he screened a movie in Xinjiang Stadium. CLICK HERE to see an album of photos from these many events. CLICK HERE to see a 10 minute video. According to Chinese news source Sina, The Myth will be screened at this year's Cannes Film Festival (May 11 - May 22) and Jackie is expected to be in attendance. This is very big news for this movie! Congratulations to Jackie! Jackie Relocating to Guangzhou Province?!?! 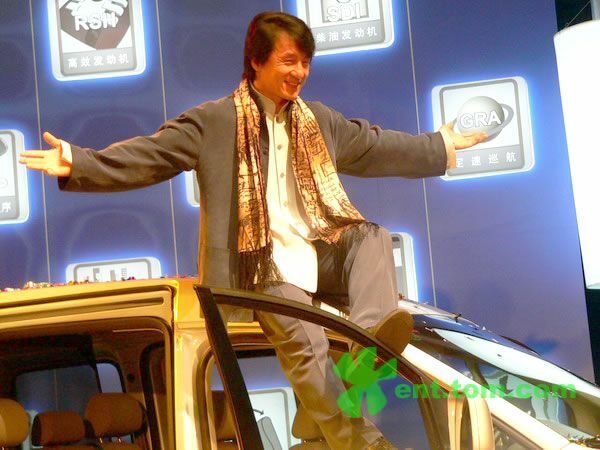 Striking a kung fu pose and taking a photo with Jackie Chan, the Hong Kong action king, will no longer be just a dream for Chan's fans in Guangzhou. 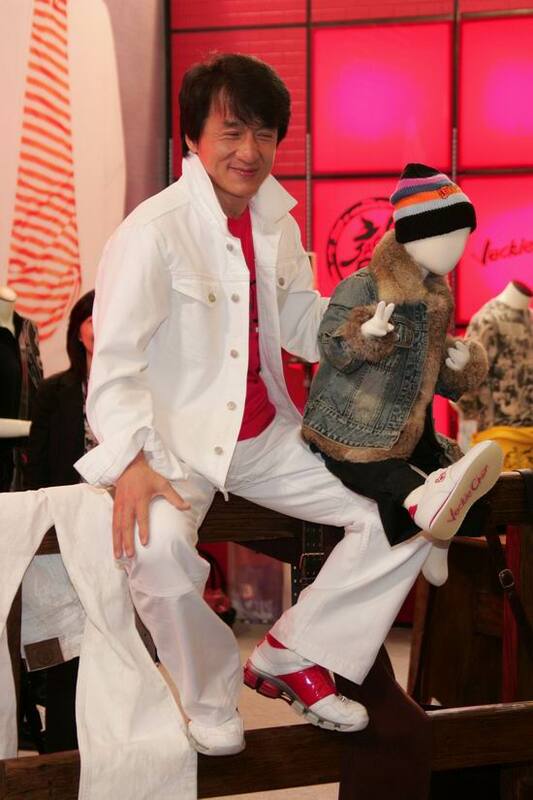 A waxwork of Jackie Chan, the most popular and expensive exhibit in Madame-tussauds Hong Kong, will make a visit to the city in Guangdong Province from April 5th to 10th. Visitors to the waxwork will get the chance to take a photo with the model without having to pay. Among over 100 figures in Madame-tussauds Hong Kong, the waxwork of Chan is the only one visitors are charged extra to take pictures with. 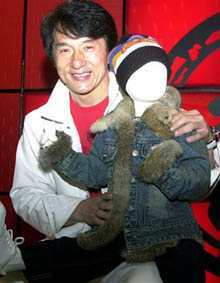 A photo alongside a wax Jackie usually sets visitors back HK$70 (US$9), the Information Times reports. 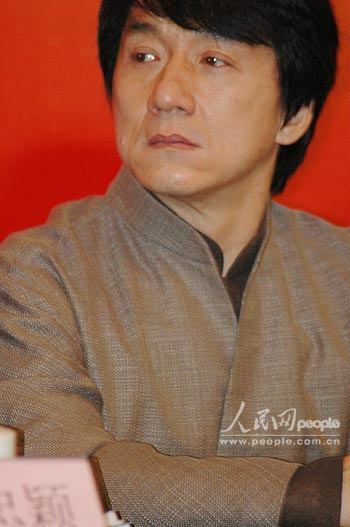 Kung fu superstar Jackie Chan is staking out opposite ends of the health spectrum _ becoming a partner in a fitness center chain while launching a new line of cookies and chocolates. Chan recently announced that his JC Flavor brand will start selling snacks _ including cheese oatcakes _ during the second half of this year. 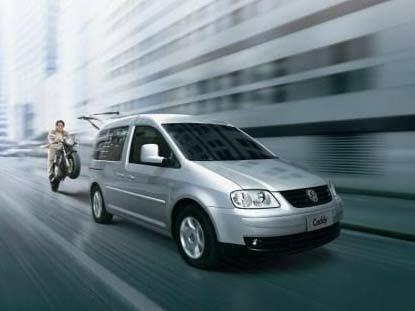 The launch will begin in Hong Kong and mainland China before rolling out to the rest of the world, a news release said. Chan's high-fiber oatcakes would be produced by Walkers Shortbread Ltd, founded in 1898 by the Scottish baker Joseph Walker, the news release said. He'll also offer cocktail and organic versions of his oatcakes, the statement said. "JC Flavor believes that its oatcake series will soon become a favorite snack for the weight-conscious office ladies," the statement said. 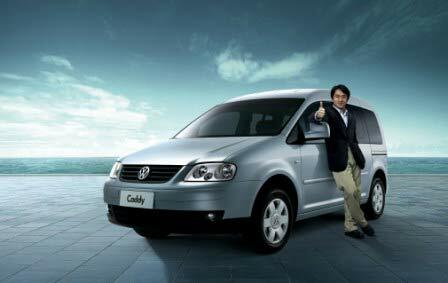 Chan also was teaming up with Italian chocolate maker Venchi, the statement said. Last month, Chan announced a partnership with the California Fitness chain, which has health clubs in Hong Kong, Singapore and Taiwan. 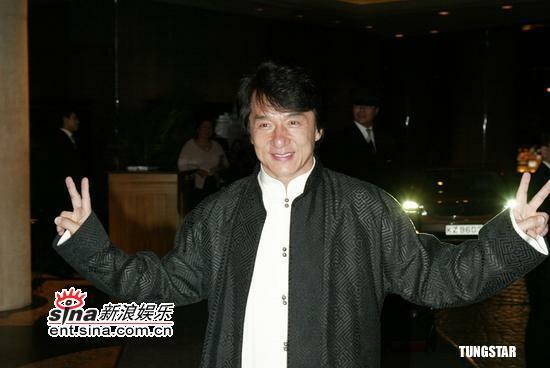 The team planned to open California Fitness Jackie Chan signature clubs in Hong Kong, Malaysia, Singapore and mainland China, the chain said in a news release. Crossing Borders Concert Earned US$4.8 million! 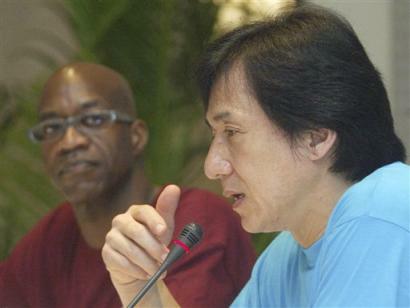 HONG KONG (AP) - Jackie Chan said Monday he will visit tsunami-hit areas in Indonesia this month, as he announced that a star-studded charity show he helped organize raised $4.8 million US for the aid effort. Chan and his entourage hoped to tour hard-hit Aceh province on April 18-20, but details of his itinerary weren't available, said actor Eric Tsang, who planned to travel with Chan. A separate celebrity group planned to visit Sri Lanka at an unspecified date. The Jan. 7 charity concert featured Hollywood action star Jet Li, Hong Kong singers Jacky Cheung and Andy Lau and Taiwanese pop diva Chang Hui-mei. Donations poured in for more than two months after the show, organizers said in a statement. Chan said he was impressed with the result and proposed making the show a permanent annual event to start up an emergency fund for other disasters. 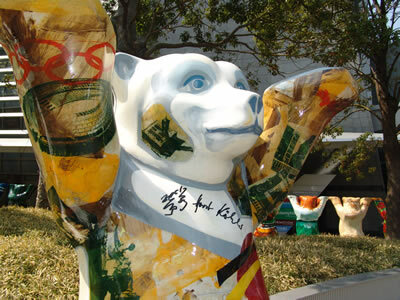 "I'm very happy and proud that small Hong Kong captured the attention of the world this way," he said. 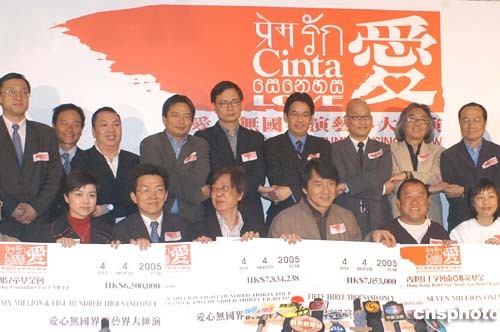 "Some Hong Kongers didn't just donate once, they donated more than three times." Tsang said the donations would be evenly split between five charities: the Red Cross, the Salvation Army, the United Nations Children's Fund, Oxfam and World Vision. The money will fund projects including reconstruction, helping fishermen and orphans, as well as psychological counselling for people who lost loved ones, Tsang said. Chan vowed to closely monitor how the funds are being used. "We will follow up ... We won't just call it a day after donating the money. This is a 10-year project," he said. 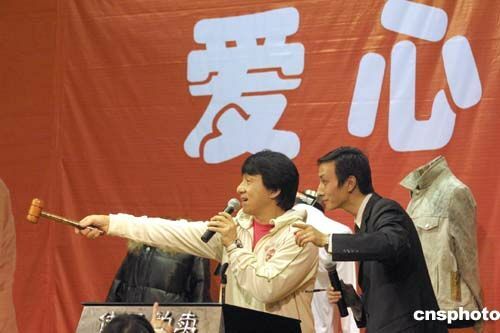 Here's Jackie conducting a charity auction in Xinjiang yesterday. This auction is to benefit elementary schools and other philanthropic causes. 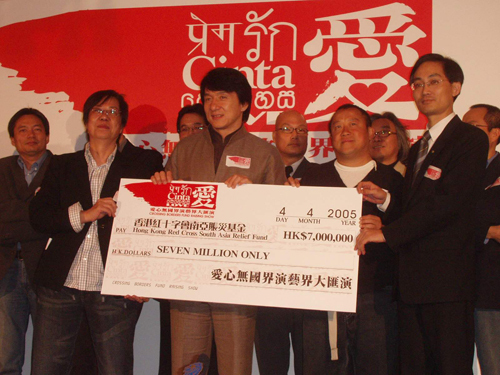 Along with other fund raisers held on April 1 and 2nd, 3.3 million Yuan was raised. Kids Corner friend Matty (age 14) from Australia has tried his hand at poster design and look at the awesome and fabulous job he did! These are just beautiful posters. Thanks Matty! Everyone knows that Jackie is the real deal, right? So everyone has been trying to imitate him for years. This is a good thing, since Jackie does GOOD THINGS. 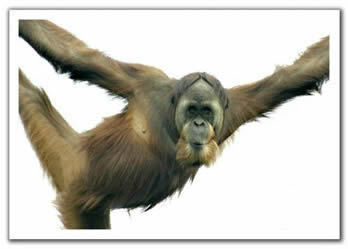 Recently, a member of the Animal Kingdom was spotted trying to be just like Jackie. He does a pretty good imitation, but he's no Jackie! Missing Buddy Bear Turns Up! Please remember: If you ever send anything to the Kids Corner and either don't hear back from the webmaster or don't see it up on the site, please send an email as a reminder. 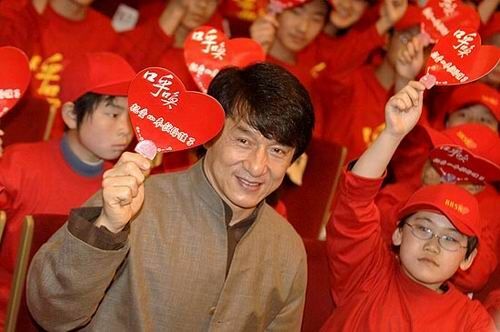 The China Children and Teenager Fund is the charity that Jackie is helping to support. June 22nd has been designated China Children's Charity Day and is celebrated with a Grand Ceremony. For more information on this charity, visit its website here. Get a box of tissues ready before you view this video. It's heartbreaking to see the little girl breaking down as she thanks Jackie for his help. Click here to view video. 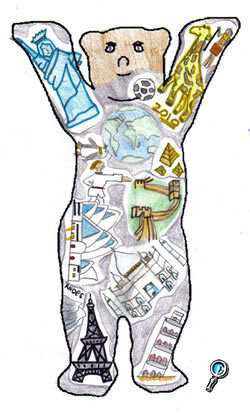 Click Pinar's "Istanbul Buddy" to view the new ones! JC Jeans Beijing Fashion Show Features Clothes for KIDS!! Check it out! This is very cool news. 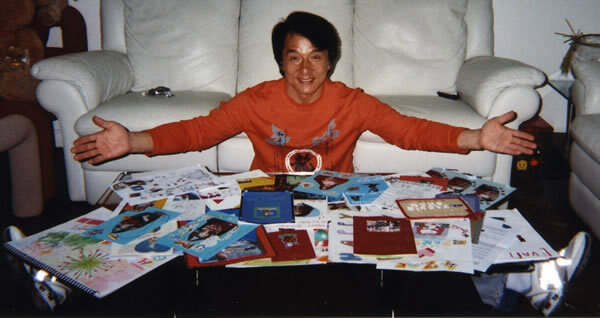 Jackie has said that he was frustrated by so many Chinese kids wearing clothing with Western sayings printed in English. He wants kids to remember their Chinese heritage and now he has made that FASHIONABLE! The clothes are really nice. There are two photos below and there are a lot more photos at this link. 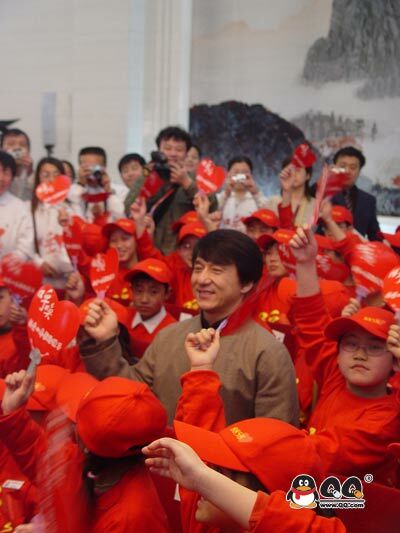 Action film star Jackie Chan will receive an honorary citizenship of Tongyong in South Kyongsang Province [Korea] for his contribution to the city. 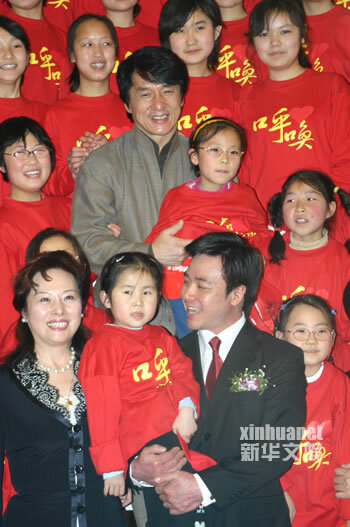 Chan will be given the honor next month to become the 11th person with honorary citizenship, said an official from the city government yesterday. Chan visited the city with local popular actress Kim Hee-sun in January, and he donated products worth 100 million won such as personal computers and clothes along with 20 million won in scholarships for children in need. Here's Jackie at the airport looking very tired (maybe from all those "After Parties"). According to the Oriental Daily website, he is going there to either bring bags of books or book bags to children. The webmaster here is having some trouble with the Chinese translation. More news as it happens. Source: Oriental Daily. Jackie's Professional Spirit Award has made the newspapers WORLDWIDE! 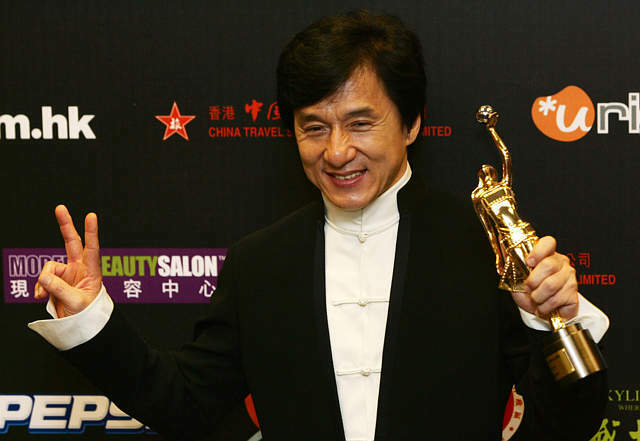 This is a very special award because it honors Jackie's professionalism and his behavior in the film industry. All of Jackie's fans are very proud of him! Here Come the Buddy Bear Minis! 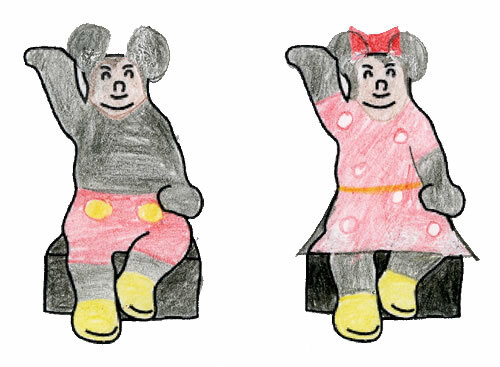 There's a new Buddy Bear blank for people to color in and it's a page of tiny little Buddy Bears. The idea is that these little bears will be used for decorating the pages of the soon-to-be-started Buddy Bear Book: Third Edition. 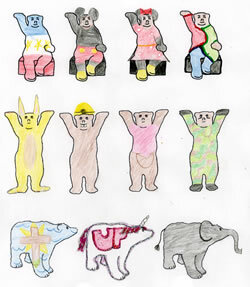 Here's a page of minis made by Priscilla, age 14. Some of them are so great that they should be giant-sized! Click on the page to see a bigger image. 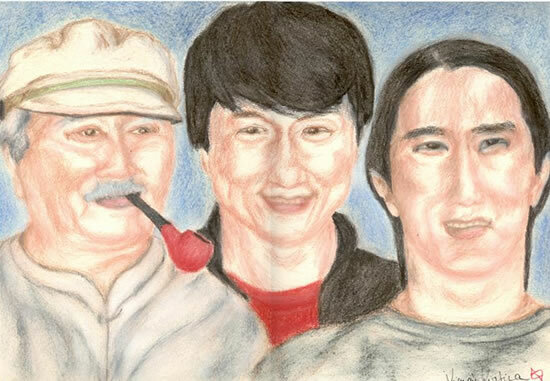 Scroll down to see two of them enlarged to show the wonderful details! 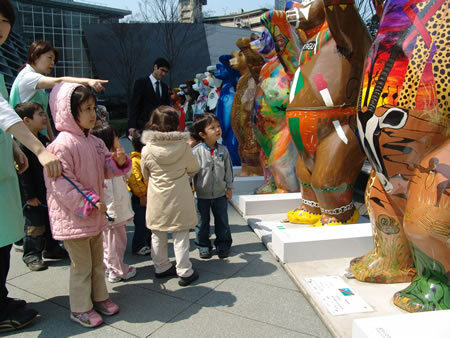 Check back in about a week to see a new section for just the Mini Buddy Bears to be displayed.